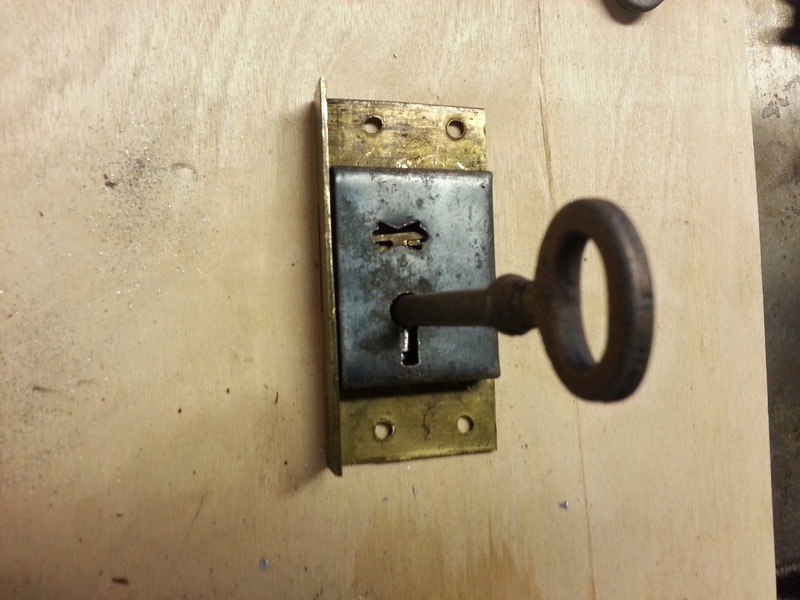 Every Time I restore a chest of drawers or cabinet that has locks, I take the locks out of the piece, clean them, and, if no key is present, I cut a new key that works the lock. After I cut the new key, I always think to myself "I should have taken pictures of how I did that!". So this time, I did. One of the most important things to have when you are making keys for locks is a large stockpile of keys of various shapes and sizes. 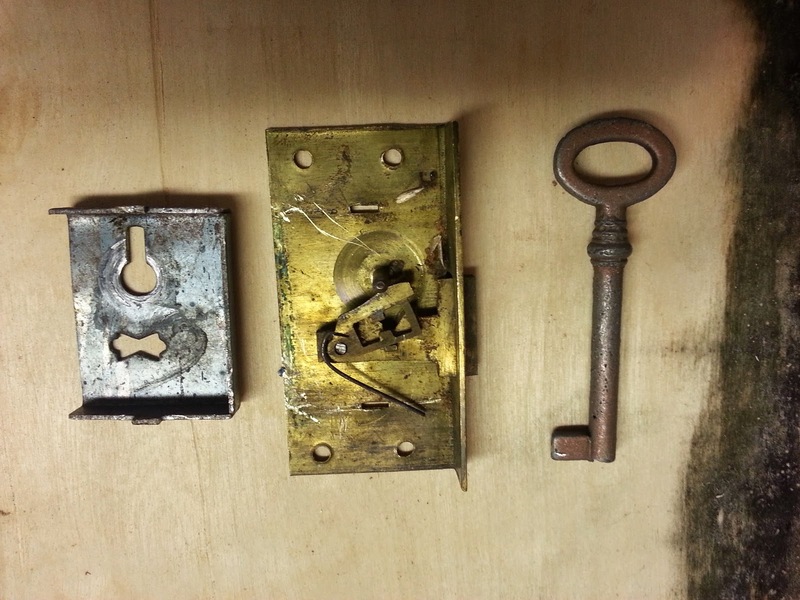 I collect old 19th and 20th century keys that can often be re-cut to work a lock. I also have several new keys which look old and are uncut, giving me the widest range of possible cuts to make in the key. 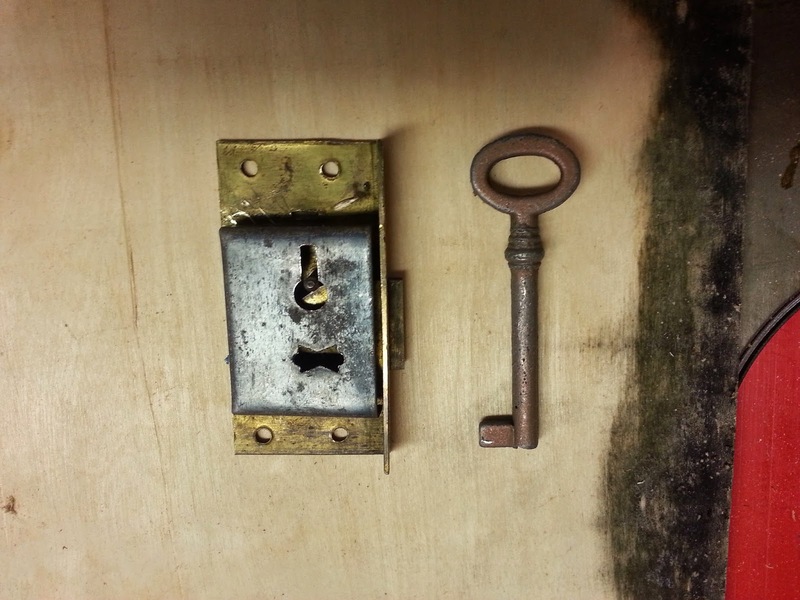 Below is a photo of the lever lock, with the key I chose to work with to the right. This is a reproduction Barrel key that I chose because the outer diameter of the key shaft fit the hole in the lock case and the blade was a little too long, giving me plenty to work with. 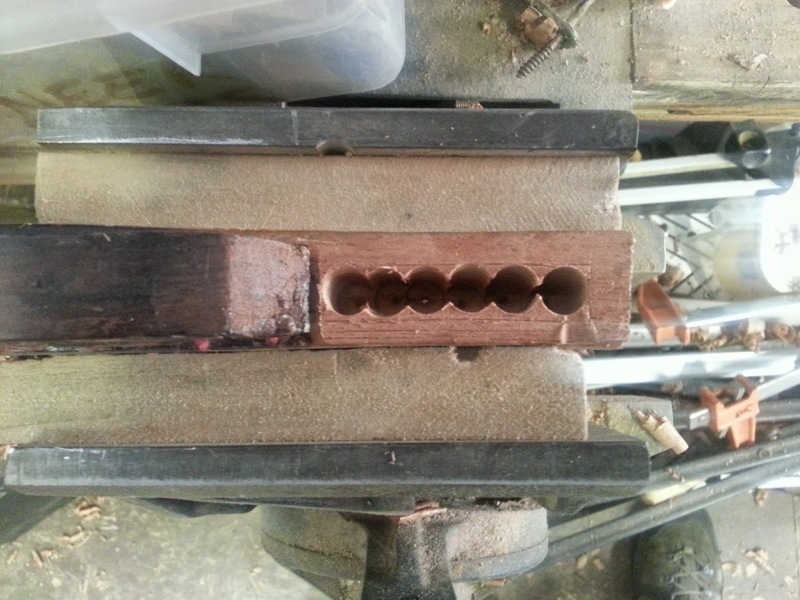 A barrel key is one where the end of the shaft is bored out so that it can fit over a post in the lock. 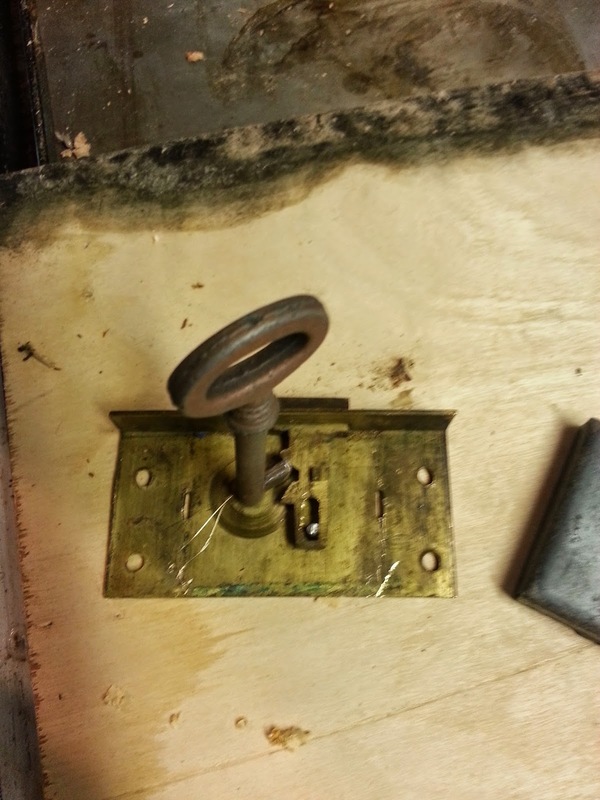 The very first step is to remove the lock housing from the lock. 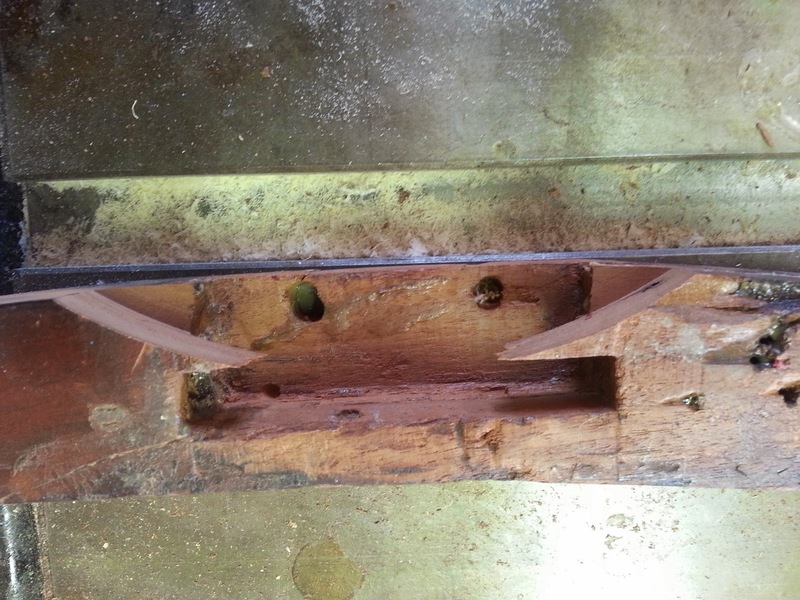 This is held to the lock with two metal tangs that fit into mortices in the lock plate, which are peened over. By hitting the ends of these tangs with a screw driver you can release the housing from the lock plate, revealing the mechanism within. 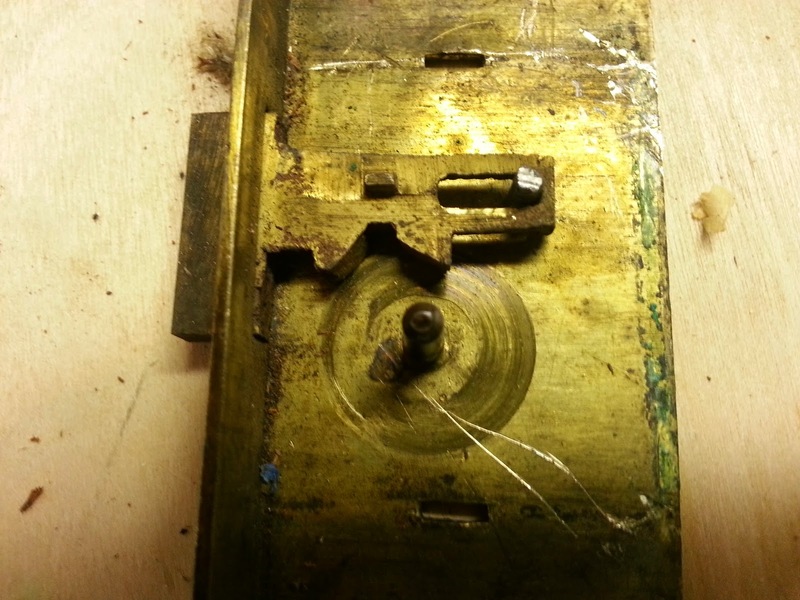 This second photo shows the lock with the housing removed. As stated above, this lock is known as a lever lock. What this means is that besides the bolt which is moved by the key to engage the lock, there is a gate known as a lever that is also moved so that the bolt can be engaged. As the key turns in a lock, the blade length has to be right to engage the bolt as it swings around. 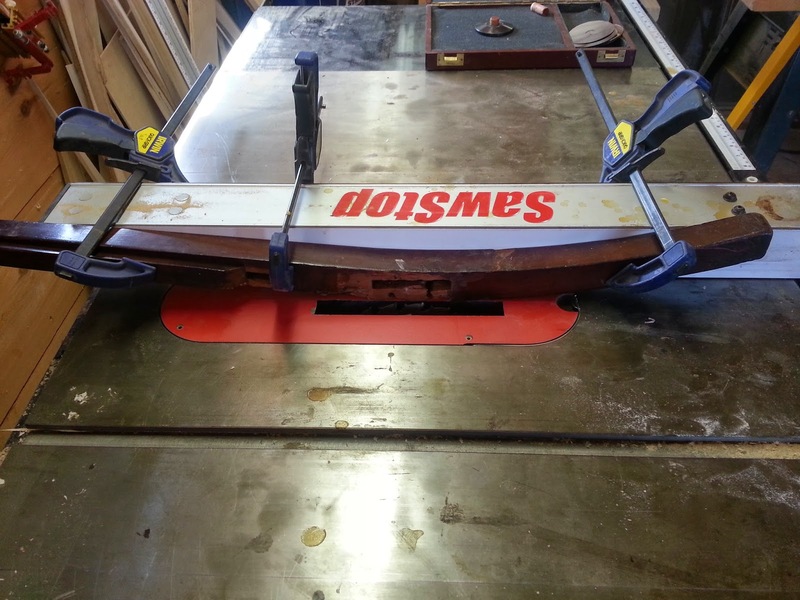 The blade length needed to move the lever is different, so a second cut is needed to move the lever simultaneously. 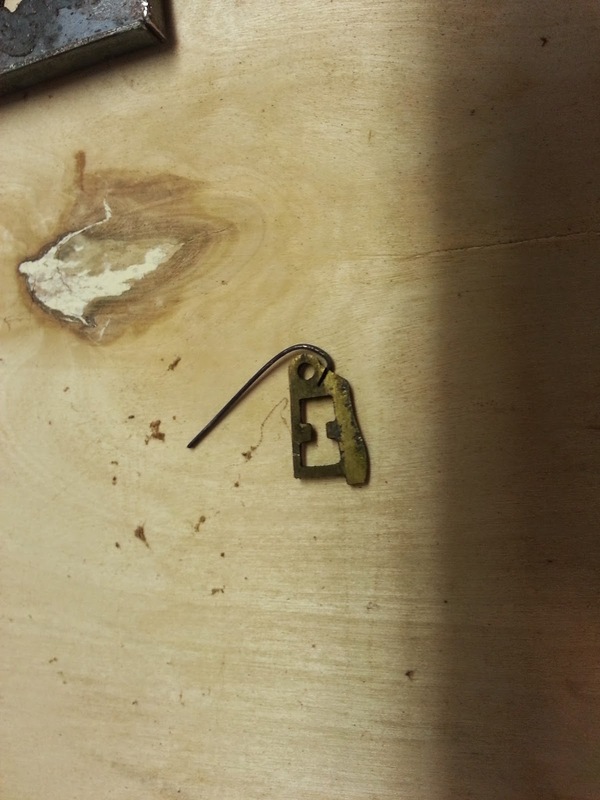 A tab of brass is attached to the bolt that moves with it, and passes through a window cut out of the lever. The cut on the key must move the lever enough to move this tab from one side of that window to the next and over a little ridge. This is also what keeps the lock in an open or closed position. Too much of a cut on the key will not push the lever into position for this to happen. 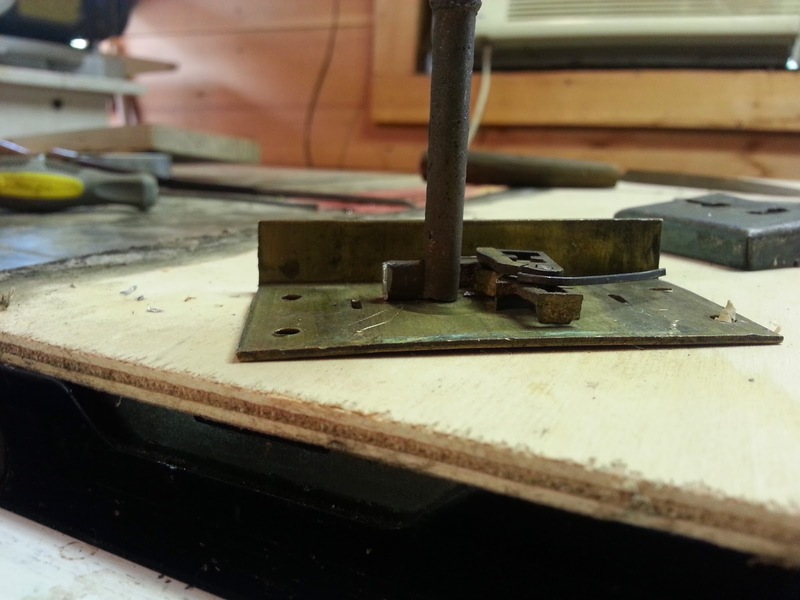 Too little of a cut will make the lever move past the position it needs to be in. 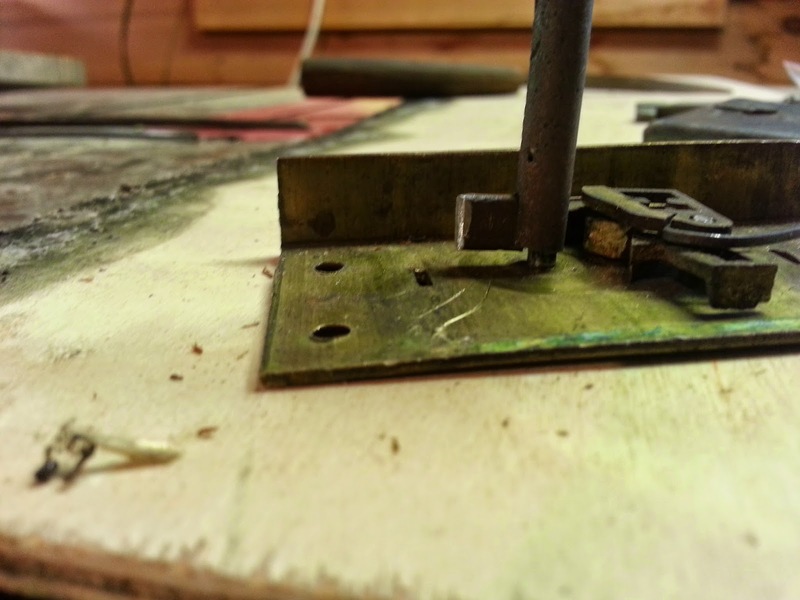 Sometimes their can be up to three levers all requiring different cuts on the key, making this a tricky lock. 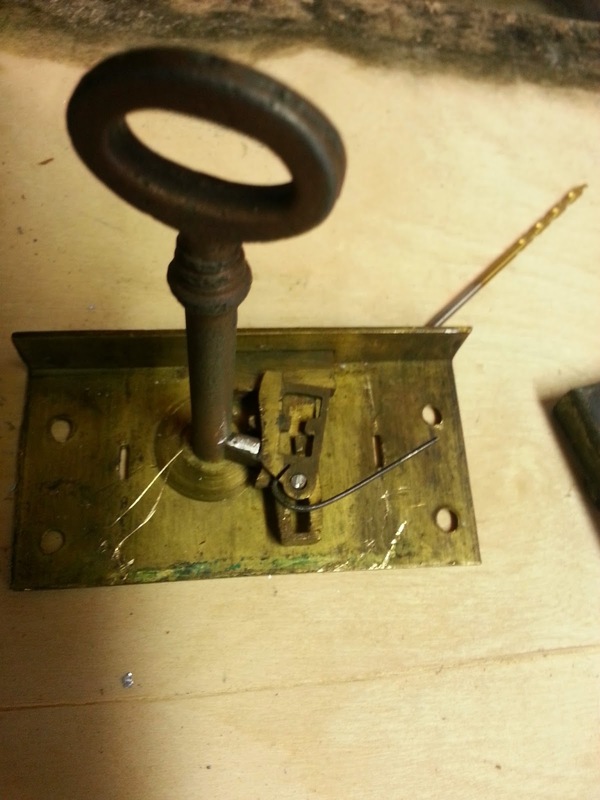 This lock had one lever, so it was relatively simple to work on. One other thing I might add is that the lever also has the spring attached to it which provides tension for the lock. If one were to try to remove the lever (making life simpler), the lock would not work. 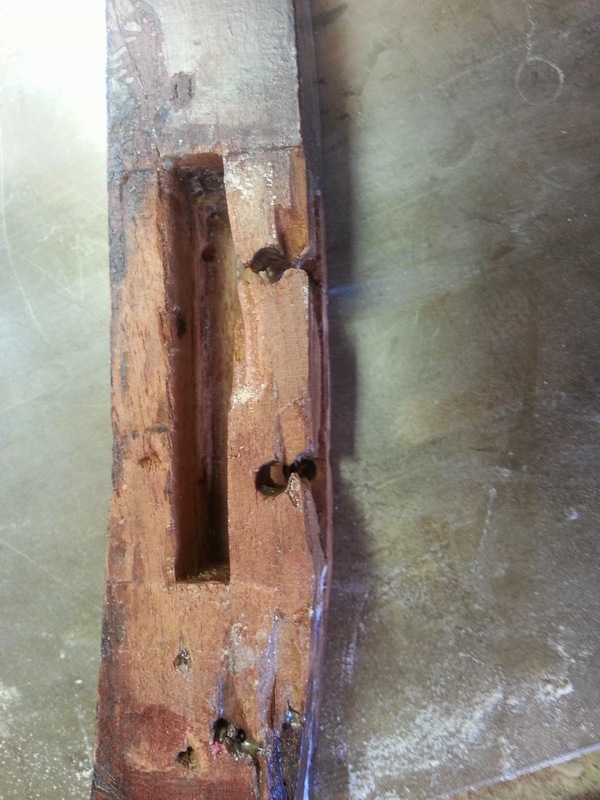 Below is a photo of the lever removed from the lock. we will get back to that later. 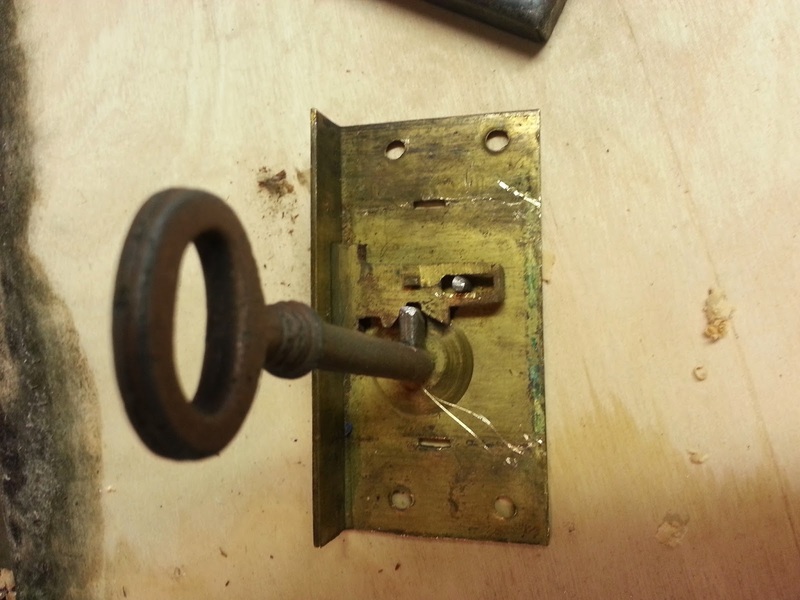 After the lever is removed, it is important to make sure that the key can pass through the lock housing and that the blade is long enough to engage the bolt and throw the lock. The key I chose fit all of the criteria with the exception that the blade was a little long. This is a good thing, because it is easy to file off the excess metal. The trick is to not file off too much metal, or the key will not work the lock and you need a new key. The photo below shows two keys from the same batch. The one on the left is the one that I cut for this lock. if you look at the blades, you can see that the one on the left is a bit shorter. 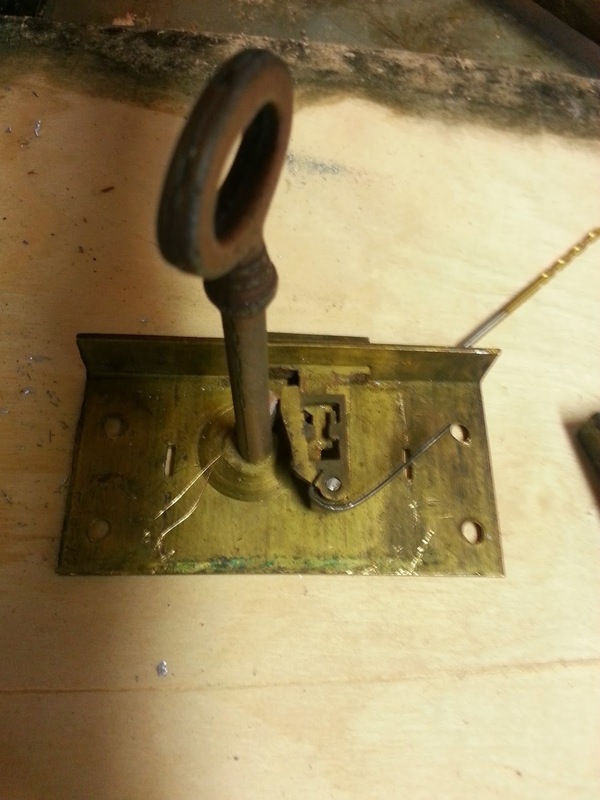 Below is a photo of the lock plate and the bolt. You can see in the lock plate where the previous key has left circular scratches from being turned over and over again. In this photo the bolt is in the thrown position. Once the key blade was cut to the right length, it turns on the post and engages the bolt, moving the bolt back and forth from locked to unlocked position. In addition to making the blade the right length, it is sometimes important to round the corners of the blade so it engages the bolt smoothly. The next three photos are of the key working the bolt. Once this was accomplished, I brought the lever back into the equation. Upon doing this I realized that the key blade and shaft was not touching the lock plate. 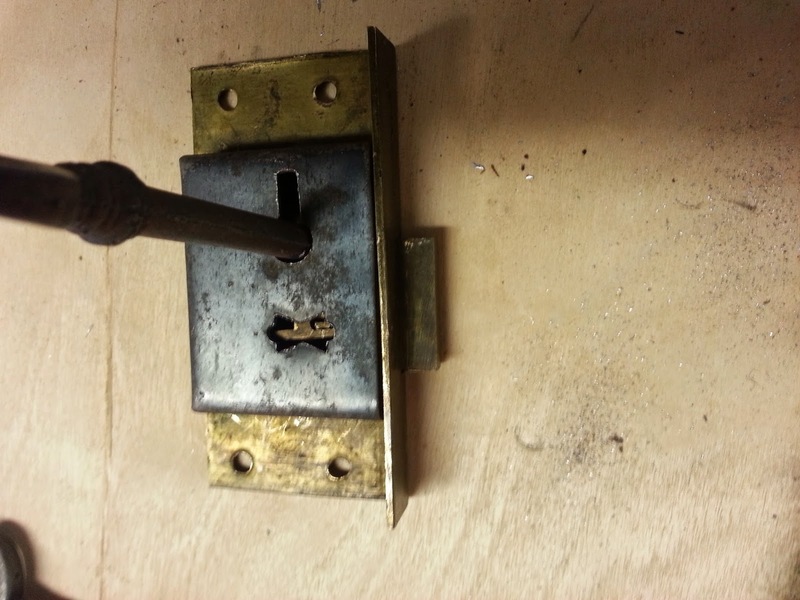 While not critical, this could potentially interfere with the lock working properly and put unnecessary strain on the post, so the answer was to bore out the hole in the end of the key a bit so the key sat firmly on the lock plate when it was fully pushed into the lock. This also is important for alignment with the various components in the lock, including the lock housing. 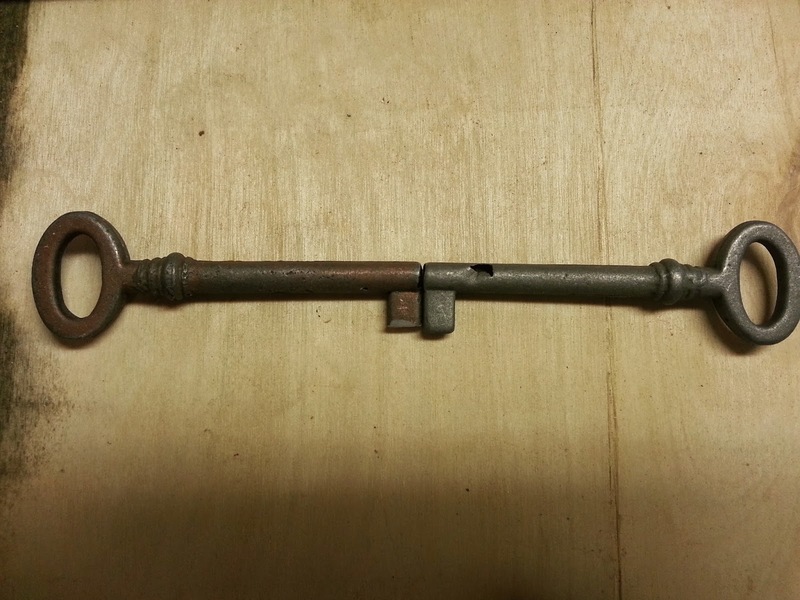 Below is a photo of the key before. 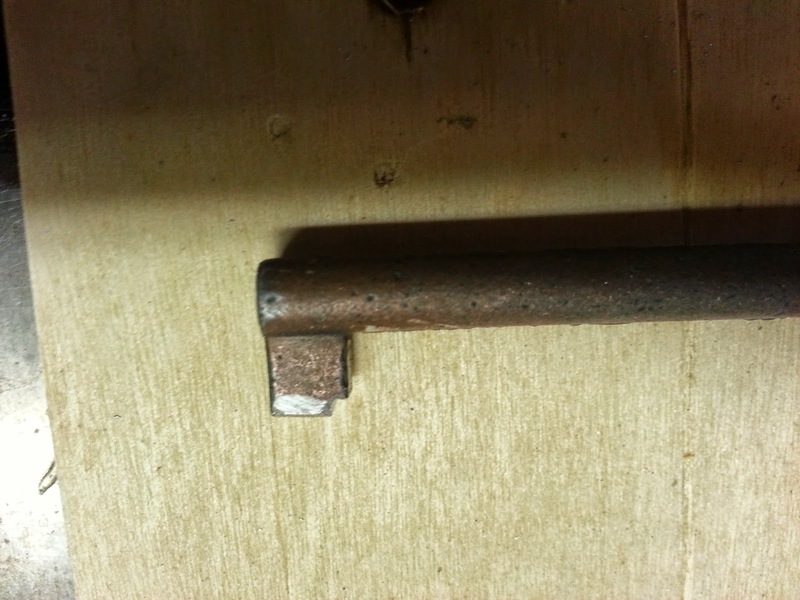 you can see that the key is sitting high and off of the lock plate. In this photo, the key has been bored out and the key is resting on the lock plate. After this was accomplished, the second cut was made to operate the lever. This is seen in the photo below as a notch taken out of the lower right corner of the key blade. If you find an old key with notches taken out of the bottom edge of the key, that key was originally used to operate a lever lock. The next few photos show the key operating the lock with the lever in place. The spring (which looks like a bobby pin) is seen to the right of the key going off at a diagonal. This would be compressed against the side of the lock housing and keep the lever under tension. 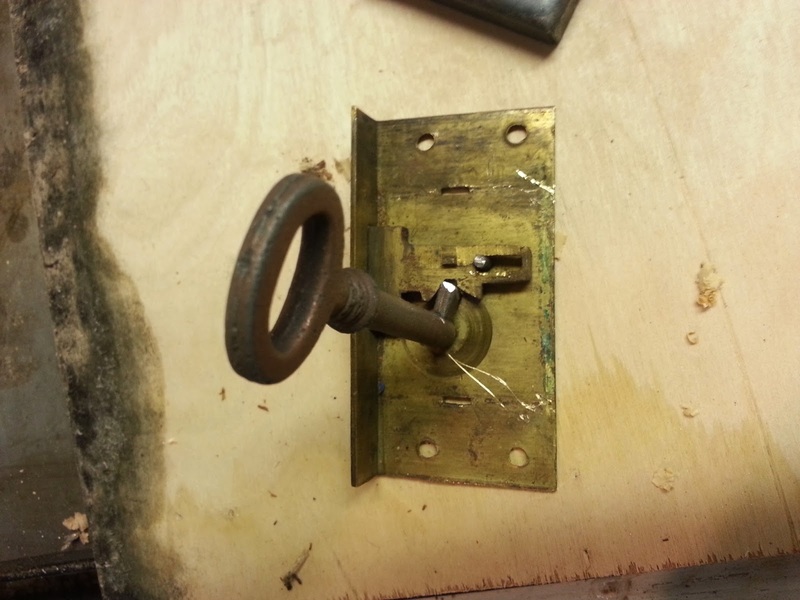 Once it was determined that all of the cuts and key adjustments were working I oiled the parts and put the lock housing back in place, putting the lever under tension. I then tried the key which operated the lock successfully. This can be seen in the last two photos below. It is slow and fine work, but as long as a lock is in good shape, a new key can be made for it and it can operate successfully. One word of caution. If you are trying this yourself, make sure that if multiple locks are going to be using the same key, that you try the key in each lock to make sure it works. sometimes the key needs to be further adjusted for multiple locks and often, a lock will have been replaced, that will use a separate key entirely. Also, make sure the key locks and unlocks the lock successfully with the door or drawer not in the case. This way, the lock can be removed and the key adjusted. The worst case scenario is that the key throws the lock, but does not unlock it,and you have done this in the case, so the lock is locked and cannot be unlocked easily! In the time that this furniture was made, it was important to be able to lock a piece of furniture that housed your personal belongings. In the 18th century, houses did not often have locks, and it would be an important security measure to keep you chests and wardrobes locked up. In today's world, this is not a necessity, but I feel that it is an important part of the restoration of the piece I am working on. 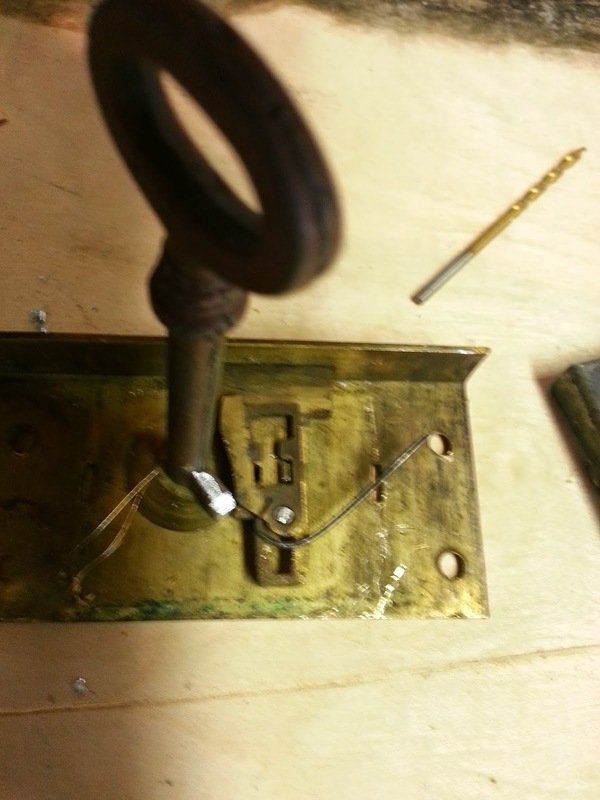 If it is possible to get a lock (or locks) working again I will make sure they operate well. 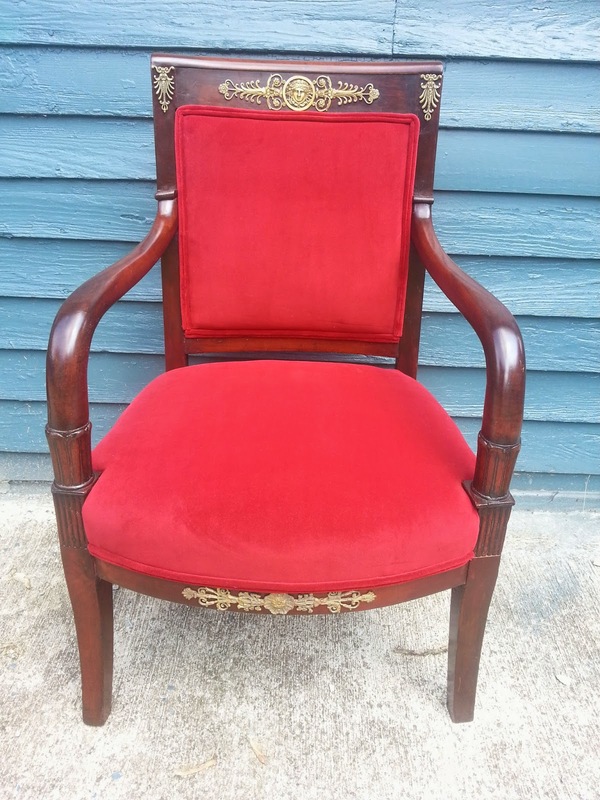 Recently I worked on two chairs made in France circa 1800. It is a little difficult to firmly put these chairs in one stylistic category, although I conservatively lean towards the French Empire Period which lasted roughly from 1804-1814, I have good reason to think that at least the arm chair was made prior to 1800 which strictly speaking would put that chair in the Directoire-Consulate period (1795-1799) that bridged the gap between the Louis XVI period and the Empire period. 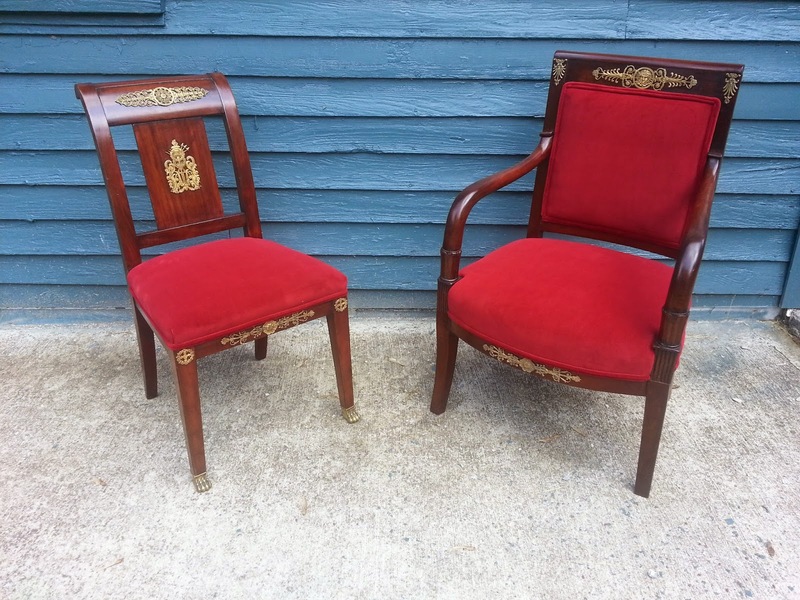 Both chairs are made primarily of Mahogany with Beech used as a secondary wood. 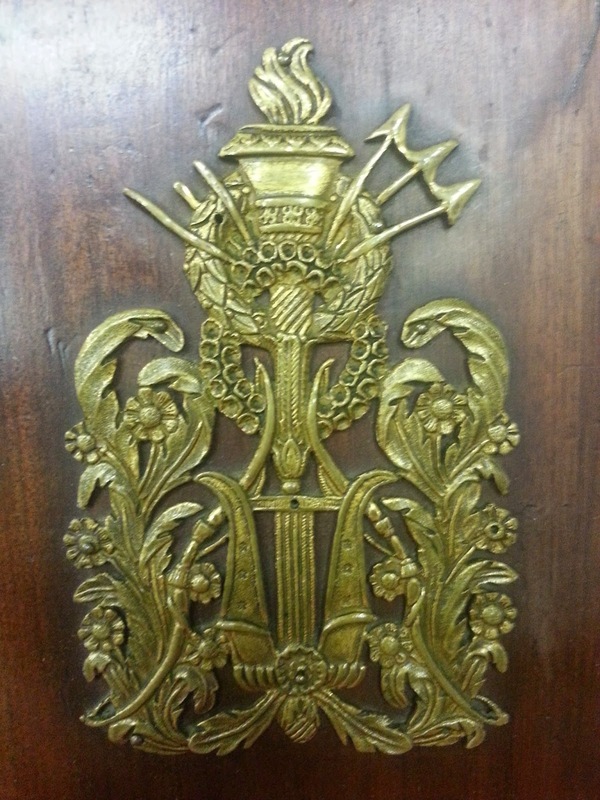 The chairs are also decorated with Bronze Mounts that were once coated with a gold and mercury amalgam called Ormolu, in which the mixture is applied to the cast bronze and then heated, removing the mercury and leaving a thin layer of gold applied to the bronze. Over time this layer has been removed by cleaning, but evidence of the original gold was visible in many places. 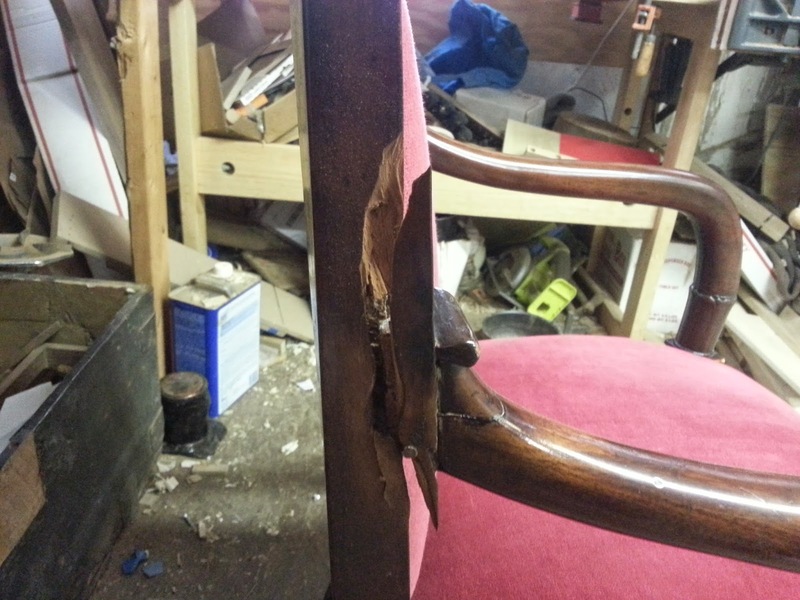 the arm chair in particular was very broken and the customer and I decided the best course of action was to remove the upholstery so that I could access the broken areas better and make better repairs. Ultimately this meant removing the back from the chair and dismantling it. 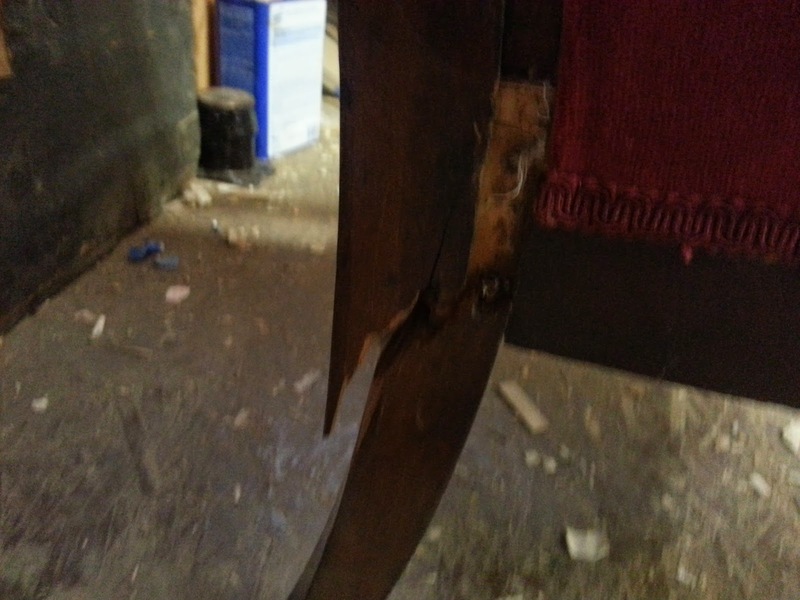 Below is a photo of the chair as it came into the shop followed by some photos of the damage to the back legs of the chair. 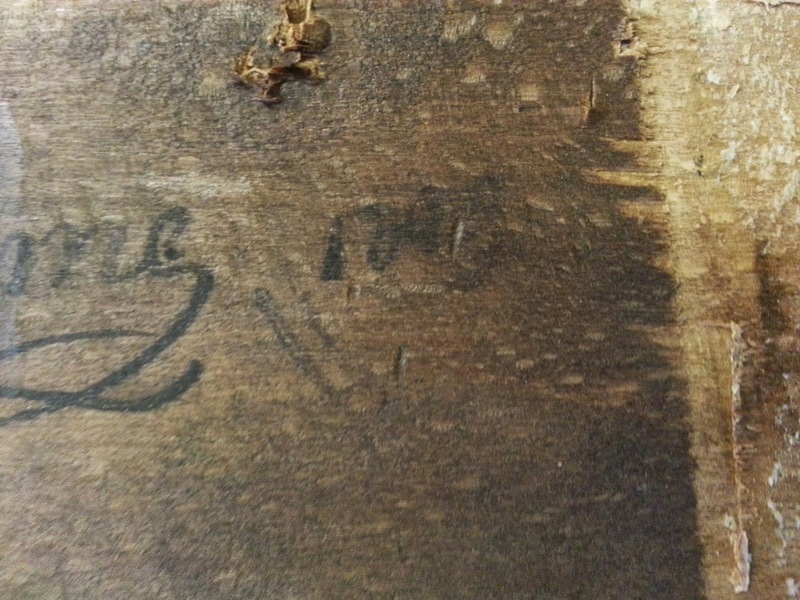 Upon removing the upholstery from the chair, I found a signature on the rear seat stretcher. 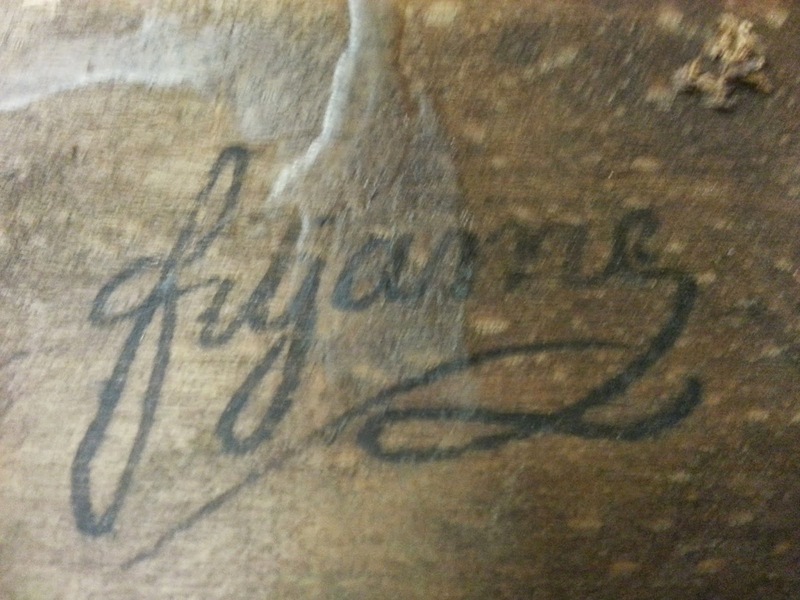 the signature was written in India ink and appears to say "Filjame" followed by a date of either 1798 or 1793. This date was very hard to read and the more I looked at it the more I felt like it could say something else! Below are some photos of the signature. I spoke with the Metropolitan Museum of Art in New York City concerning the signature. The museum houses a large collection of Continental furniture and so I figured they might know of this maker. The had not heard of him, but suggested that this could also be the signature of an upholsterer. 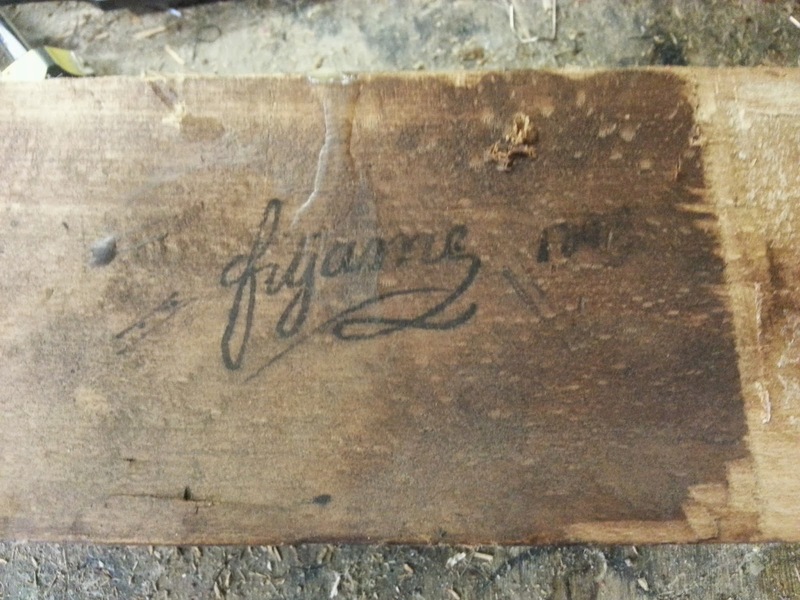 My feeling about it is that it is the signature of the cabinetmaker due to the interior prominence of the signature. This signature is well executed and centered on the interior of the rear seat stretcher. It was meant to be seen ( once the upholstery was removed) and it almost seems to exude pride in workmanship. Although this is all speculative, it is my feeling on the matter. As far as the date is concerned, being signed in the 18th century would make the chair older than the Empire period by a few years. All of these styles evolved and several design motifs spanned periods, especially when they were short lived. The tendency we have to place a piece of furniture in a specific period is relatively modern, and to the maker and the original owner, it would have been a chair made in the latest fashion. 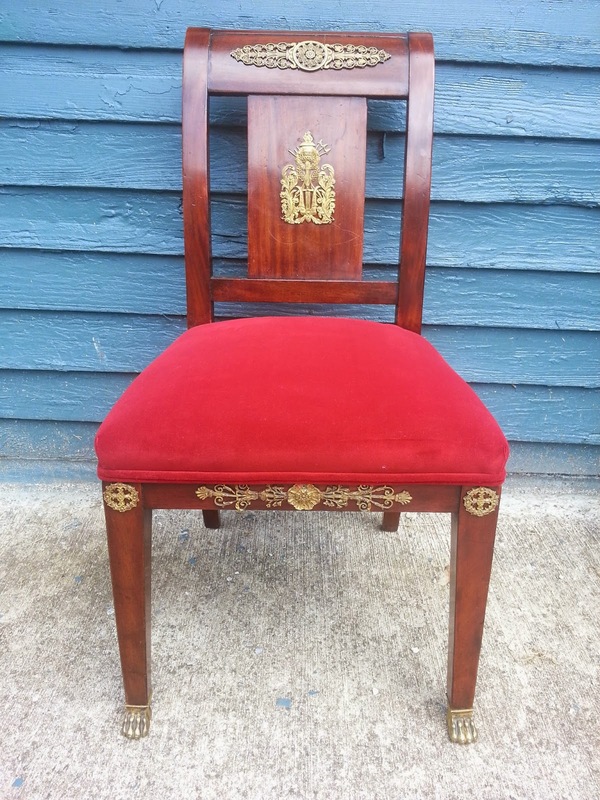 Either way , it is a well made chair that employs beautiful West Indies mahogany and great design. 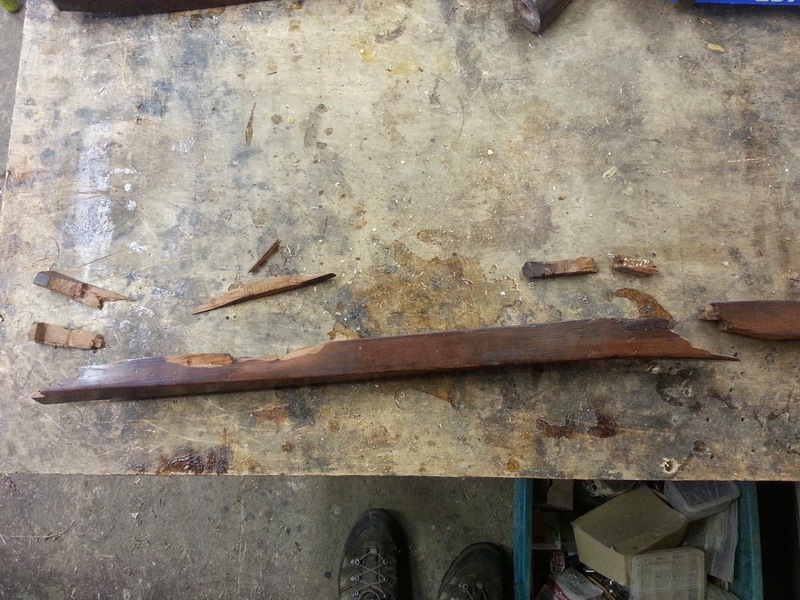 Once the chair was dismantled, the first step in repairing it was to glue all of the broken pieces in place. 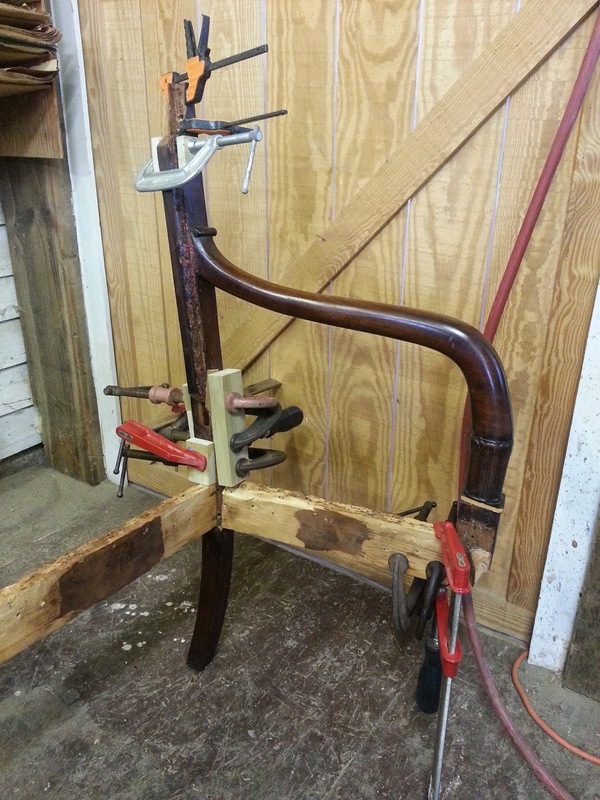 These were all centered around the joinery in the back of the chair, in one case where tenons for a seat stretchers meet the rear leg and in another, where the crest rail is joined to the rear leg. 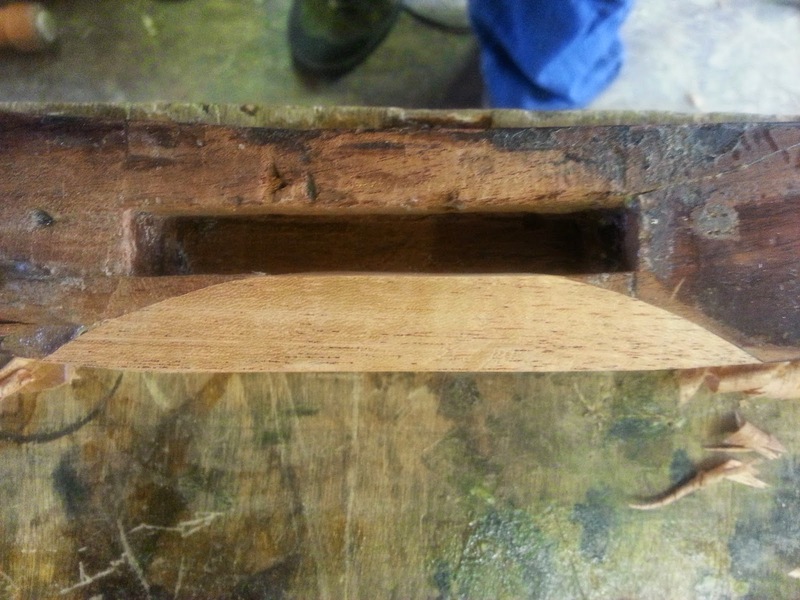 In either case, these areas were weakened by removal of wood to create mortises and further weakened with the introduction of pegs, used to secure the joints. 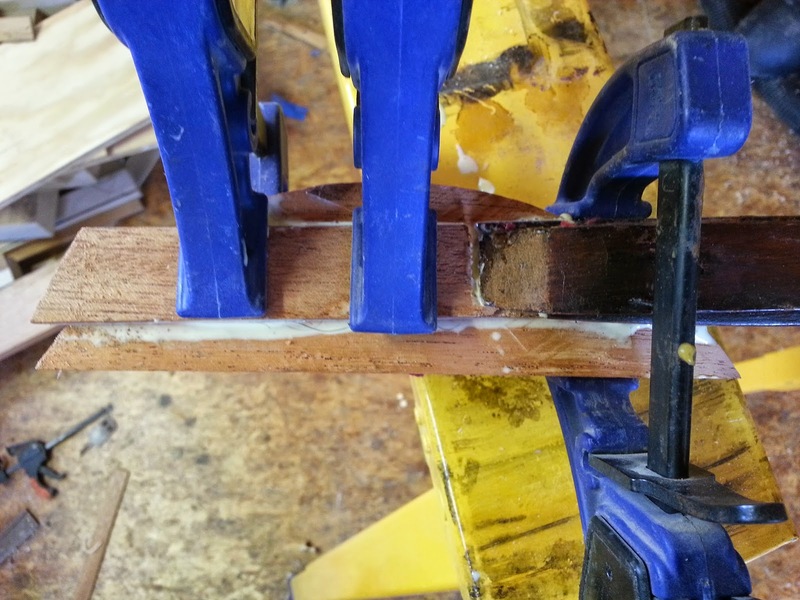 At first, these joints were sound and the loss of wood was countered by tenons glued in place. 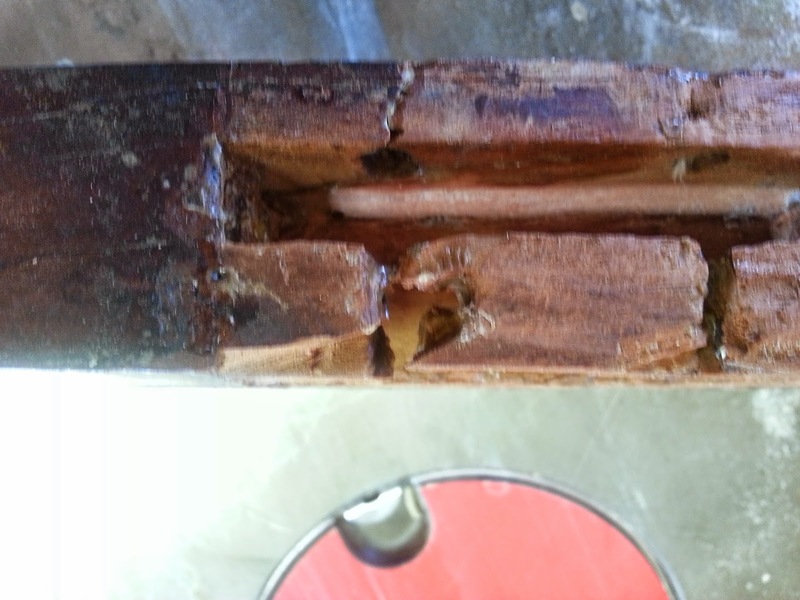 After 200+ years, the glue failed and the wood became brittle, leading to the structural failure. 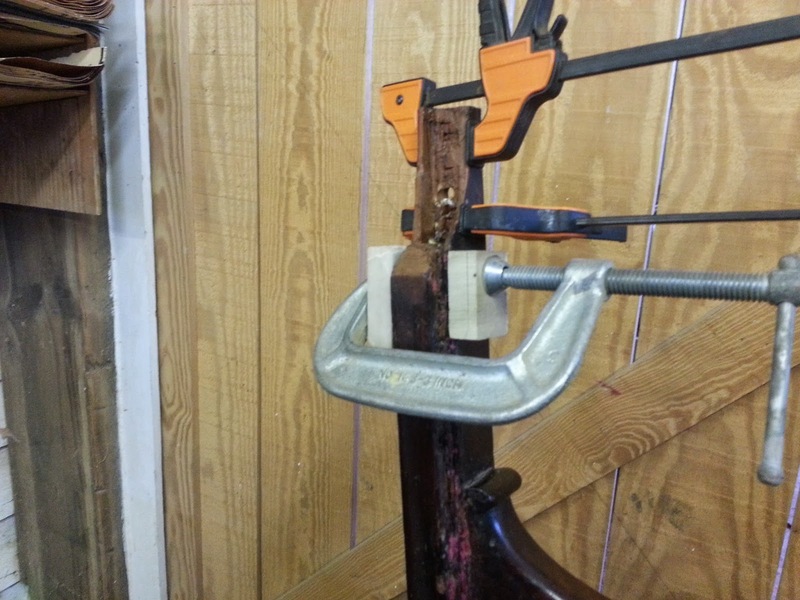 Below are a few photos of the broken pieces being glued in place on the right rear post (The direction is given as if you were facing the chair). The left rear leg, seen below was in much worse shape. 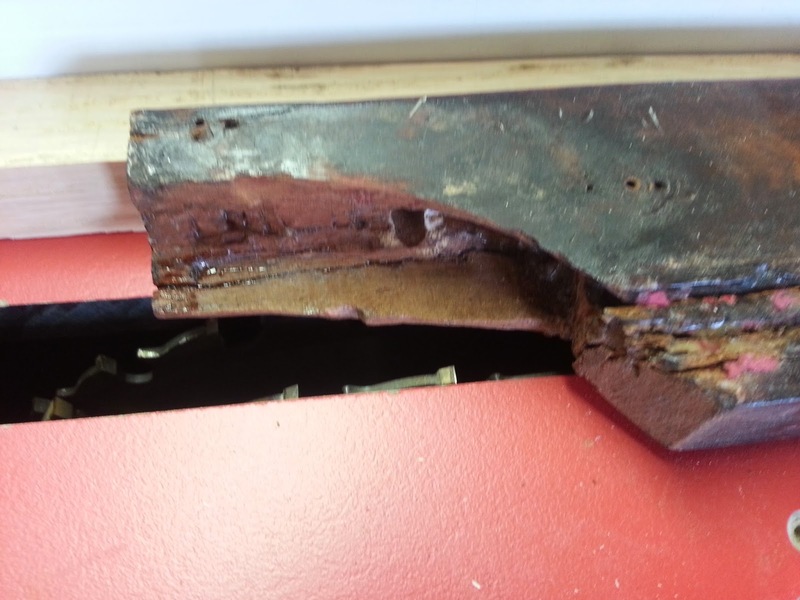 Here is the left rear leg after it was glued back together. 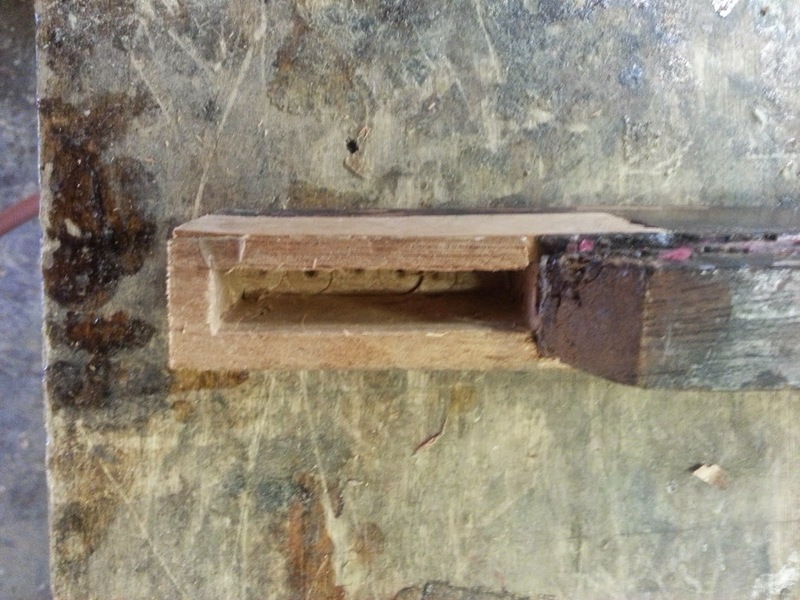 One problem in this leg was that when the joinery was pegged, the holes from the pegs broke the internal shoulder of the mortise, making this shoulder structurally pointless. I decided to rectify this by removing a bit of wood and putting a patch that would be solid and bridge the lower and upper parts of the leg. 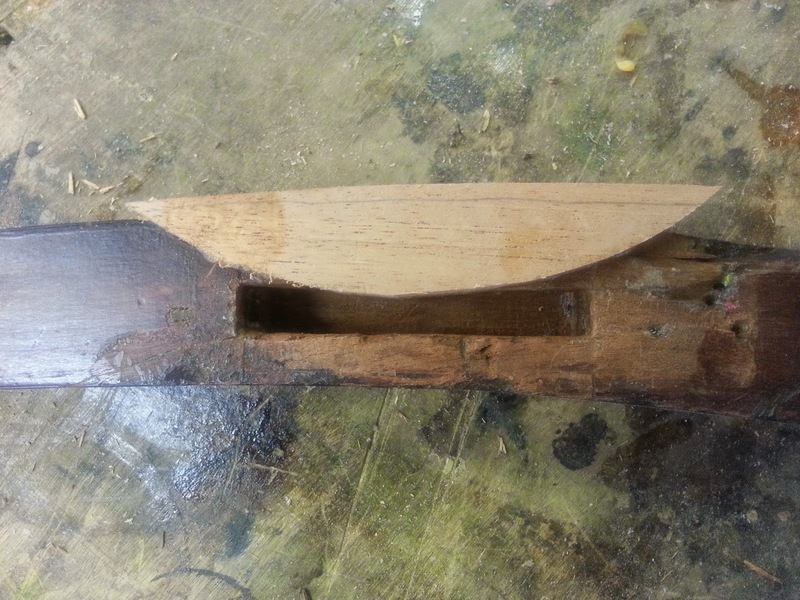 Again, the location of this mortise is at the seat stretcher/leg intersection. To create this patch, I employed a new method for me. It involves creating a negative space for the patch with a stacked dado blade (picture a bunch of round table saw blades sandwiched together in the table saw). 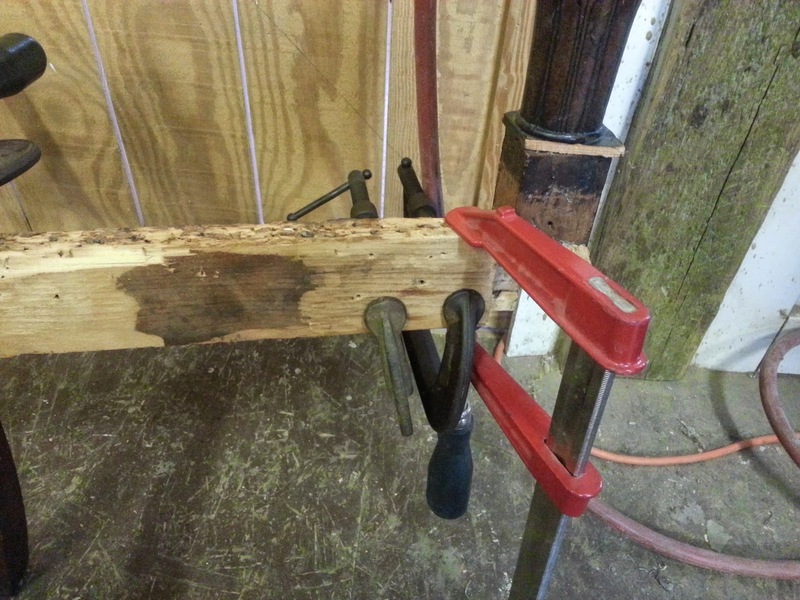 I first clamped the leg to the table saw fence and secured it in position, and then raised the blade into the stationary leg. This can be seen below. 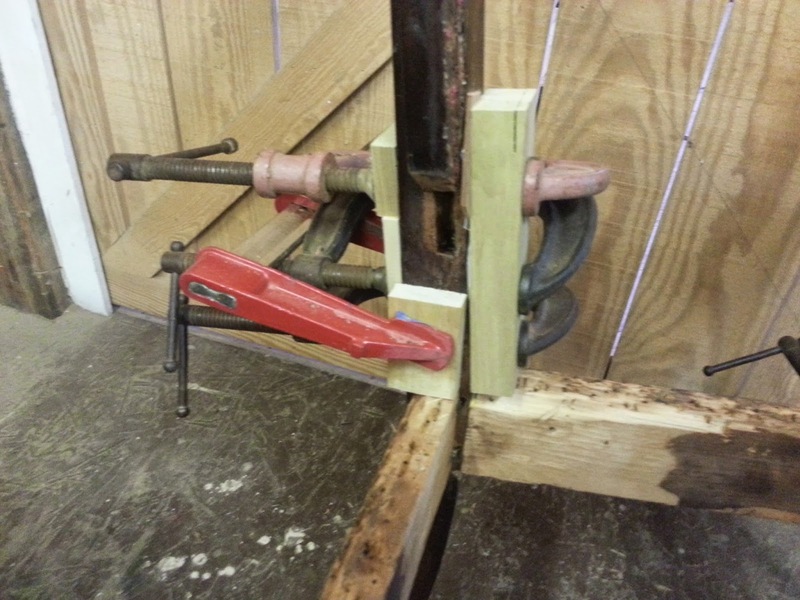 Leg clamped to the fence, the blade is lowered into the table. Detail of the photo above. 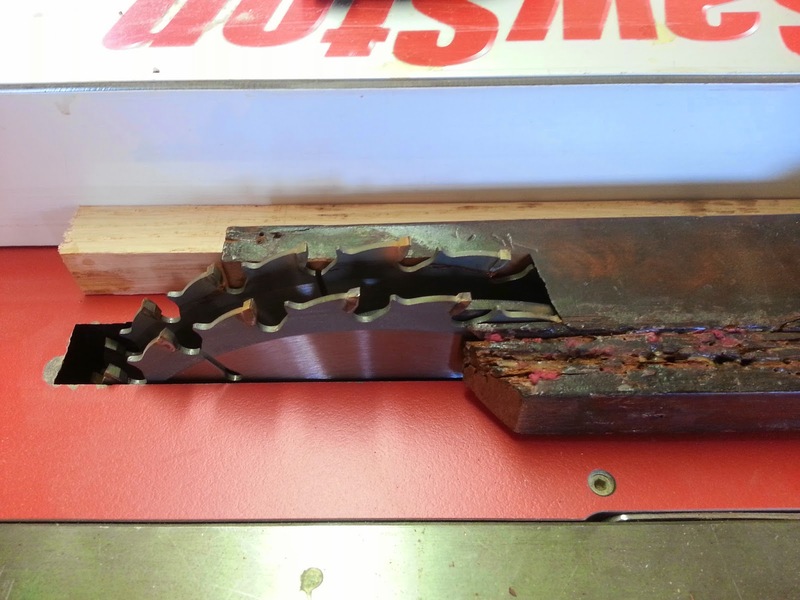 While the blade was running, I slowly raised it into the wood, removing the damaged material and creating a negative space in the diameter of the blade. 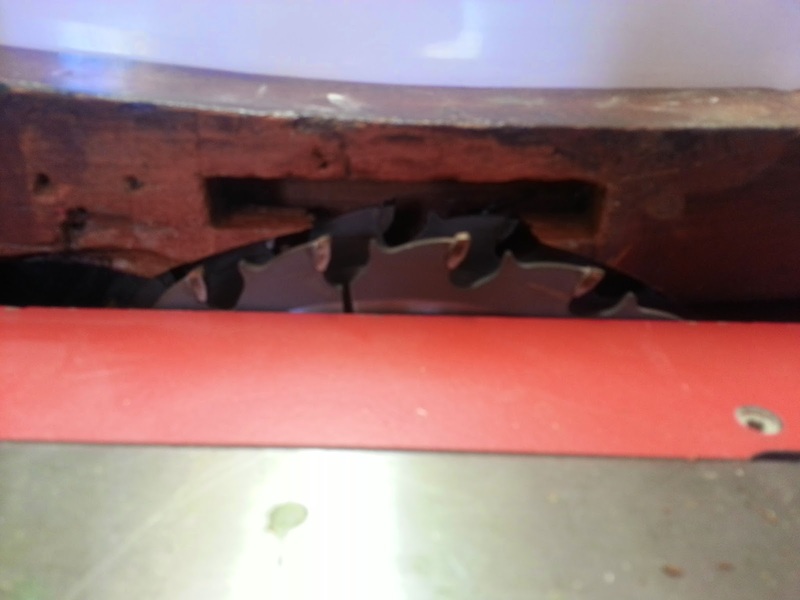 Below is a photo of the leg with the arced negative space cut by the dado blade. A similar procedure was done on the other leg, where the crest rail met the right leg. A close up of the damaged area. 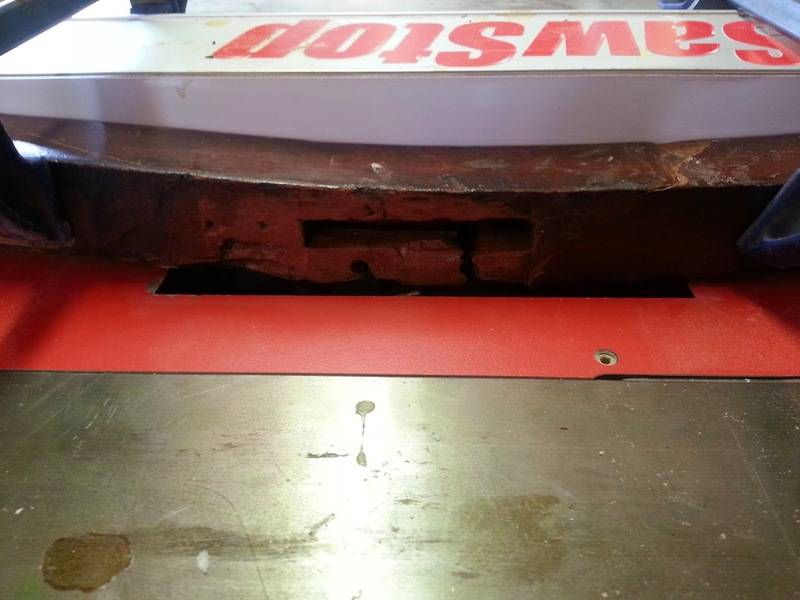 The damaged area being removed by the dado stack. Once the negative spaces were made. 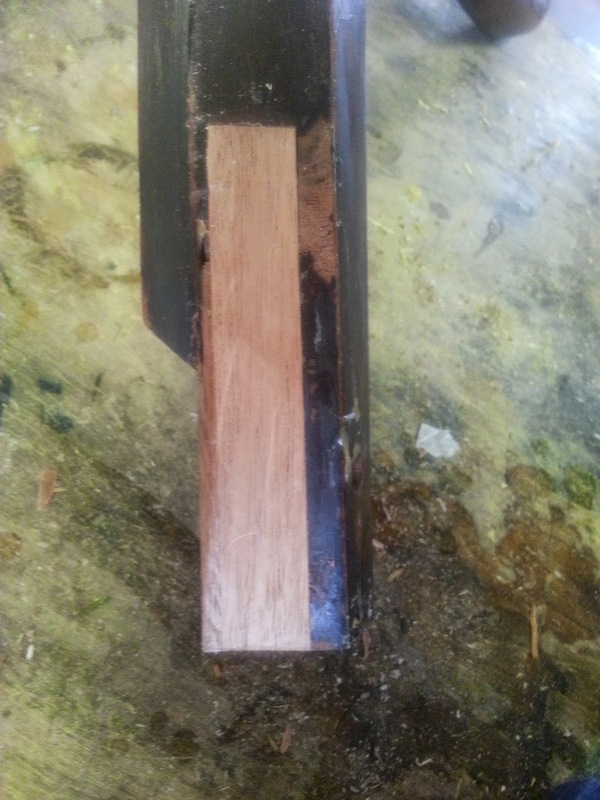 I milled a piece of mahogany to the exact thickness of the space cut by the dado stack. 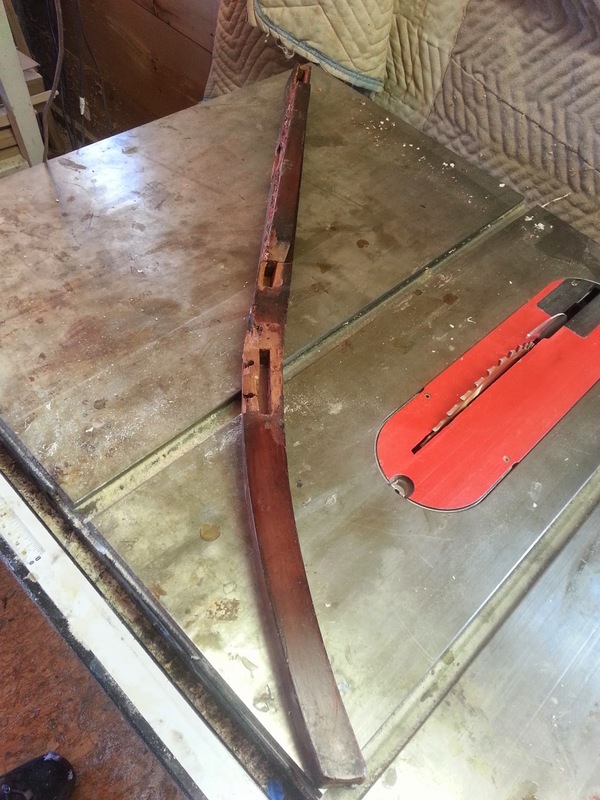 I then used a compass to trace an arc at the same diameter of the dado blade. 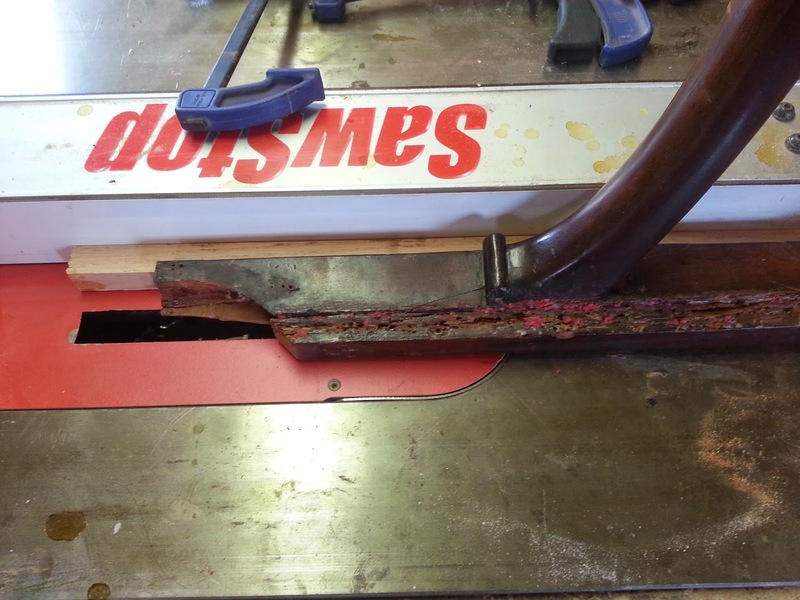 I then cut the arc out on the band saw, giving me a patch that fit perfectly into the negative space made by the dado blades. Below is a photo of me scribing the arc. 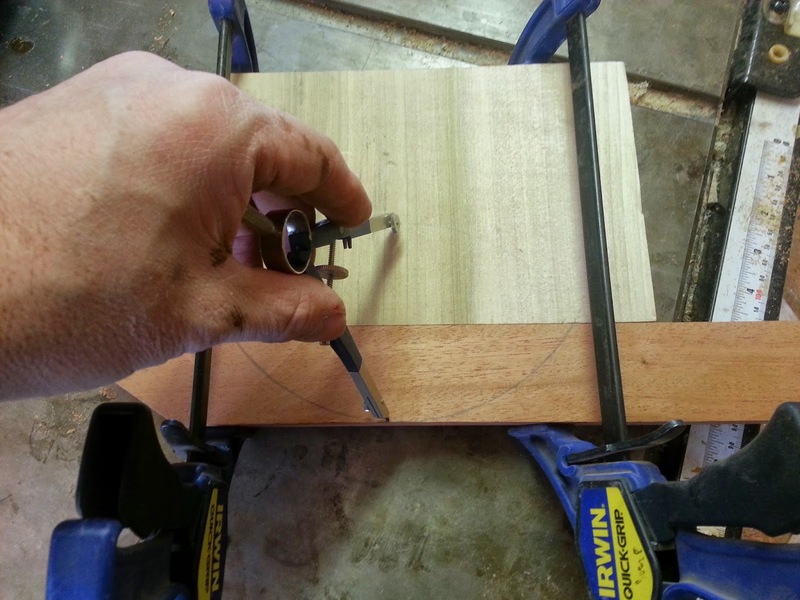 I clamped a piece of poplar to the mahogany to give a center point of the compass and then drew the arc. Clamping the patch on the rear right leg. The patch on the rear right leg once it was pared flush with a chisel. The patch at the seat level on the rear left leg before and after it was pared flush. 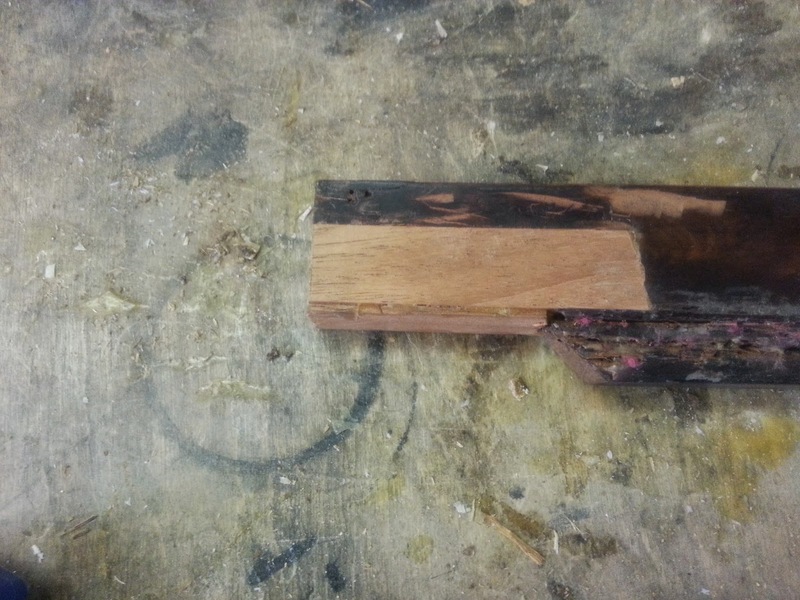 Drilling out the patch on the rear right leg to create a mortise that would accept the crest rail tenon. 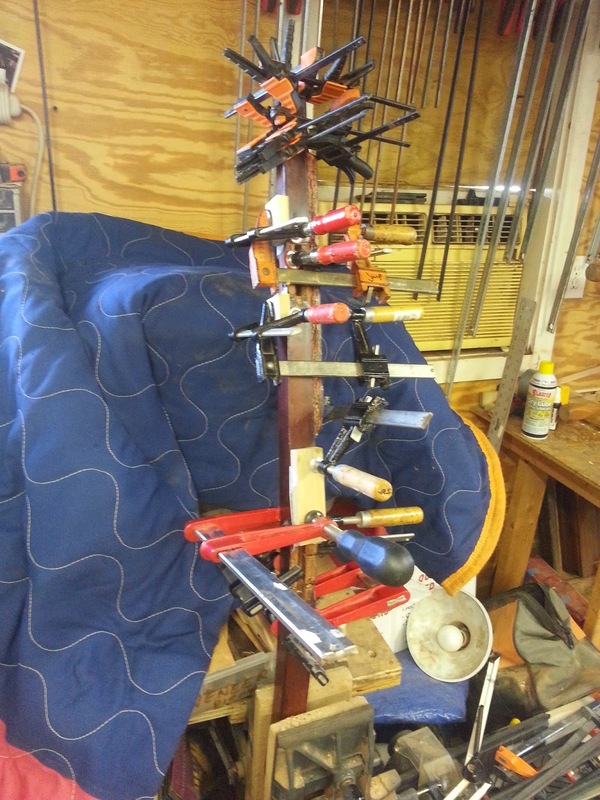 I learned of this method of patching by discovering it's use in a chair I was reparing. While not handwork, I like this patch because it is an effective method of repair and can be concealed within the workpiece a lot easier then a hand cut patch. I have used it in several scenarios and have found that it works great every time. 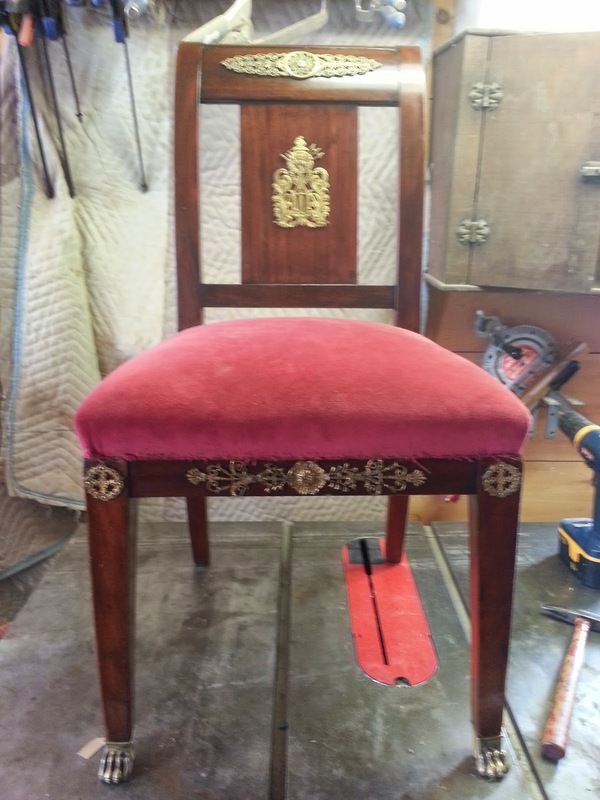 The side chair was in far better shape structurally and really all that it needed was to have the finish cleaned and the upholstery changed to match the armchair. 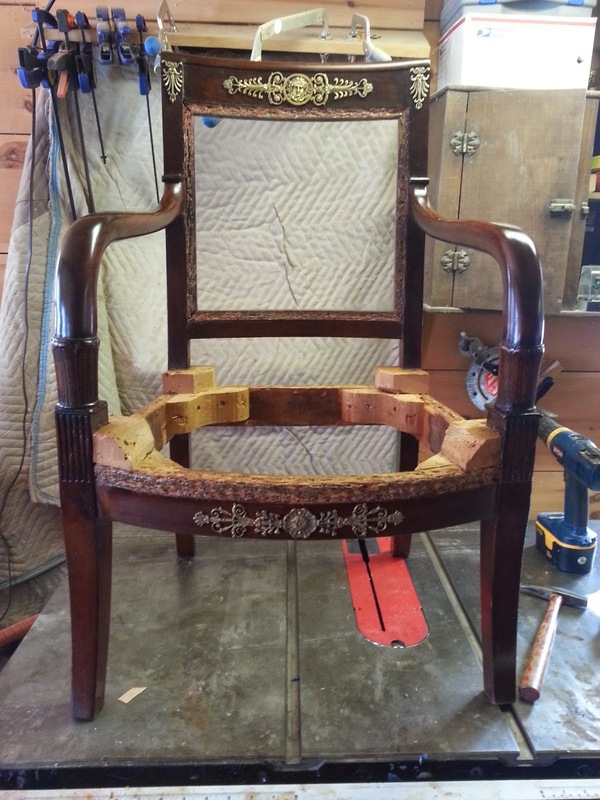 Here is a photo of the side chair as it came to the shop. 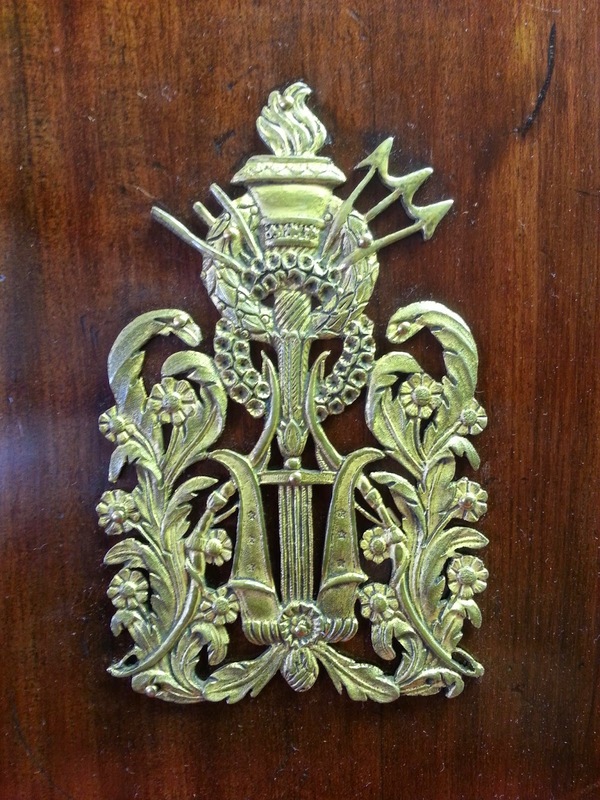 A close up of the ormolu mount on the splat. Neoclassical themes abound! To clean the Ormolu, I decided to use alcohol on a soft rag in opposition to an abrasive like fine steel wool. This would preserve any gold left on the bronze. Below is a photo of the same hardware cleaned. 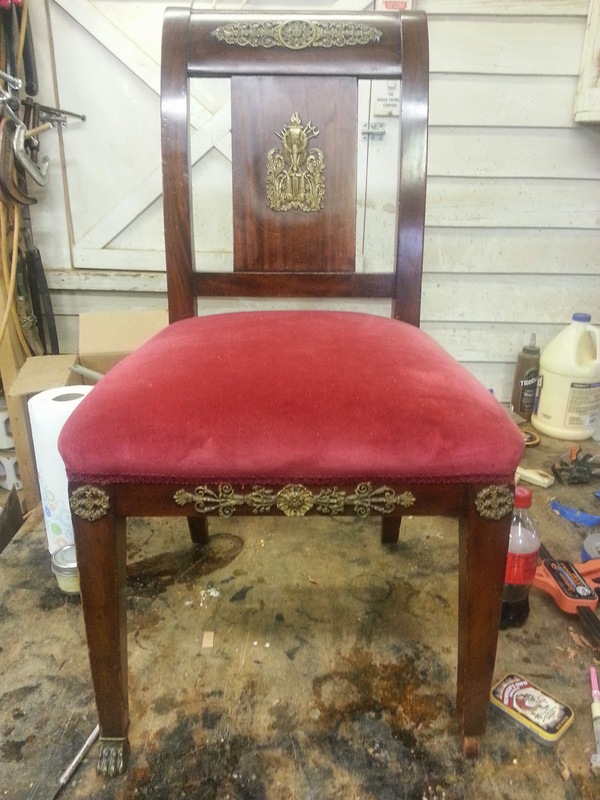 Here is a photo of the side chair with the finish restored ready to go to the upholsterer. Because I did not need to fix any structural problems on the chair, I left the upholstery on and the upholsterer removed it. 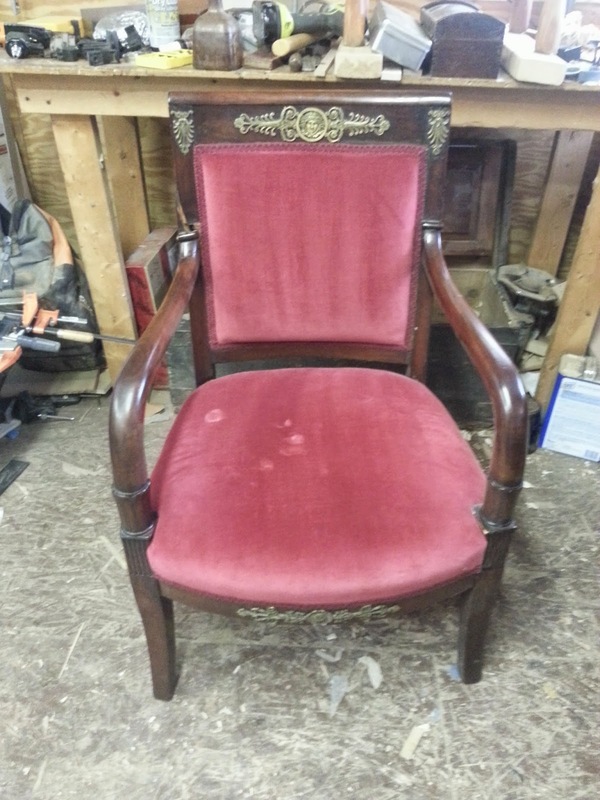 This photo shows the arm chair restored and ready to be upholstered. These final photos are of the chairs once they returned from the upholster.